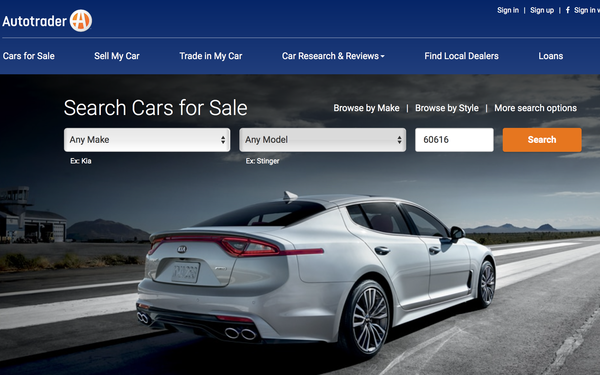 Cox Automotive’s Autotrader is rolling out a new website and other enhancements that aim to provide a faster, more personalized vehicle shopping experience. More than 2 billion car shoppers have visited the popular third-party vehicle website the past 20 years. But the company felt the need to evolve, said Jessica Stafford, Cox Automotive senior vice president and Autotrader general manager. The new Autotrader went live in January with the launch of a mobile-first homepage. There will be a staged roll-out of other enhancements throughout the calendar year, Stafford says. The brand is planning a cross-promotion with TNT/NBA sponsorship to make consumers aware of the changes. “We have a robust marketing strategy planned to support the all-new Autotrader, including a new consumer-focused TV, digital and social marketing campaign scheduled to roll out in the coming months,” Stafford tells Marketing Daily. Zambezi is handling creative. The redesign of the Autotrader homepage, along with other site enhancements, are being led by Autotrader’s internal product team. The mobile-first homepage offers faster loading times and a more efficient shopping journey that connects more consumers with the cars they want to buy. Major enhancements include online deal-making and integration with Kelley Blue Book. These enhancements also will result in more engagement, higher quality leads and actual car sales for Autotrader’s dealer clients, Stafford says. Car shoppers have set clear expectations of how they like to shop and transact online, she says. They want to have a trusted and transparent experience that’s fast and enjoyable.